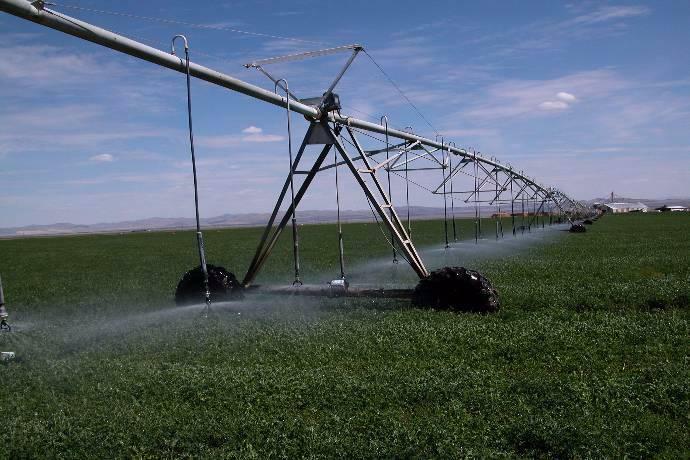 New research reveals trends in irrigation water use efficiency in Cache Valley, like this pivot irrigated alfalfa field. "There’s been a 245 percent increase in the number of farms of 1-9 acres along the Wasatch Front since 1974. That’s pretty significant," said Tyler Pratt, a water engineer with Keller Associates in Pocatello, Idaho. According to Pratt, larger farm parcels in Utah are being fragmented into smaller family and urban farms. However: "The Division of Water Resources is predicting that the current water demand will exceed the available supply by 2040. Very little is known about water use in the sector of urban and small farm agriculture," Pratt said. To better understand this knowledge gap, Pratt and his collaborators conducted a case study of small farm irrigation water use in Cache Valley. "I measured the water use and evaluated the irrigation practices on 24 urban and small farms in Cache Valley and on those farms that calculated their total water use and various efficiency metrics," Pratt said. Pratt found that small fields, especially fields with fixed irrigation schedules were less efficient and tended to overwater. And that mixed gardens had the most efficient water use. "That is a significant finding," he said. "It means that if you wish to promote water conservation, promoting gardens as an alternative to landscapes has the potential to save water, compared to irrigated landscapes. That's interesting because that actually accomplishes multiple objectives of conserving water at the urban, in the municipal and industrial sector. But it also helps meet the objective of the growing trend of local foods, and self-reliance." Water availability in Utah is a complicated matter, but Pratt says this research offers state and municipal agencies insight into water use practices on small farms, an increasing agricultural sector in Utah.